Writing With Skill combines time-tested classical techniques–the imitation and analysis of great writers–with innovative contemporary insights. Models from great literature provide the student with inspiration, while step-by-step instructions explicitly teach the skills that other writing programs merely assign without explanation. Original writing assignments in history, science, biography and literature expand the student’s intellectual horizons. Designed to be used along with Writing With Skill Level 3 Student Workbook, this book turns every parent or teacher into a skilled writing instructor. Clear, detailed teaching instructions help you guide even reluctant writers into mastery of essential writing skills. 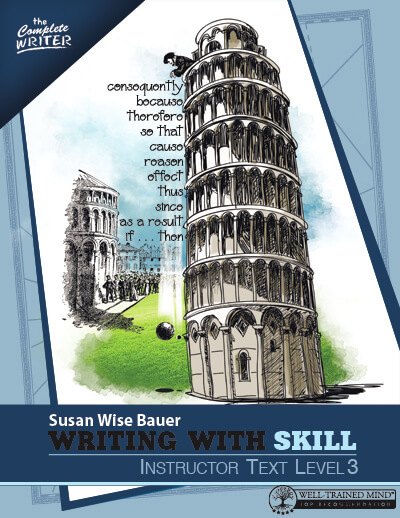 ABOUT THE AUTHOR: Susan Wise Bauer has taught college-level writing and literature at the College of William & Mary in Virginia. She is the best-selling author of the Story of the World series and the Writing With Ease series for elementary students, as well as the co-author (with Jessie Wise) of The Well-Trained Mind: A Guide to Classical Education at Home. I have a rising 8th grader who has never used Writing with Ease or Writing with Skill. Can I start him with Writing with Skill level 2 or 3? According to the author, every student should start Writing With Skill at level 1, because the skills covered there are foundations of what’s covered in levels 2 and 3. It is perfectly fine for an 8th grader to use WWS 1, and to then do WWS 2 in 9th grade and 3 in 10th grade.